The Casino in Madrid is undoubtedly one of the finest architectural magnificences in the Spanish capital. Its dripping chandeliers and sweeping, red-carpeted staircases, Michelangelesque frescoes and immaculately costumed staff recall an era of rarefied opulence quite at odds with the down-to-earth bonhomie of today’s Madrileños. We aren’t here simply in the interests of the puttin’ on the Ritz, however. Nor do I feel a flutter at the roulette wheel coming on. It’s mid-December, the city is awash with enough Christmas glisten to outsparkle ten Regent Streets, and the Fundación para la Cultura del Vino, the institute dedicated to improving the understanding and appreciation of the best wines that the world (not just Spain, mind) has to offer, is mounting its annual showcase tasting. 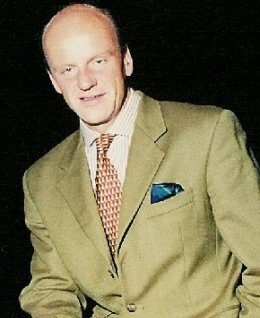 The guest in 2007 is Egon Mülller of the celebrated Scharzhof vineyard in the Mosel valley, Germany. I had the good fortune to be seated next to Mülller (right) at dinner the night before the tasting, and was struck by the unassuming nature of the man. One always imagines that proprietors of ancestral vineyards, whose wines sell for more than I’ll earn this month, will be all noli-me-tangere chilliness. Quite the reverse, in this case. Mülller approaches his export markets with an attitude of genuine humility, aware that, in today’s crazy market, delicate white wines full of grape sugar need a little more selling than oaky Chardonnay. Spain has always gone mad for Mülller’s wines, partly, so the winemaker thinks, as a result of the national sweet tooth. Tastebuds habituated to churros with the morning coffee, and slabs of deliquescent turrón at Christmas, won’t have trouble negotiating high-residual Rieslings. 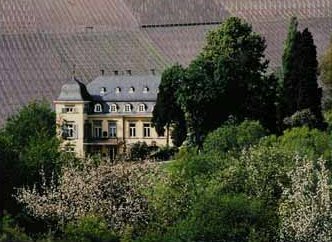 The marriage of one Felix Mülller into the Koch family in 1837 inaugurated the present viticultural dynasty at Scharzhof. Prior to the sacking of Trier by French revolutionary forces in the 1790s, the vineyard land had belonged to the church, as a significant proportion of the Mosel still does. Successive generations of Egons, of whom the present incumbent is the fourth such, have managed the estate, establishing its undisputed pedigree in a part of Germany where there is no shortage of contenders for the quality crown. As ever, low yields are the principal key. Rarely climbing above 30 hectolitres per hectare here, the grapes produce wines that have the telltale higher viscosity – even at the lowest sugar levels – that comes from exceedingly modest productivity. The vineyard is planted on the Scharzhofberg hill (left), on south-facing slopes of stony, slaty soil, where the gradient rises to a back-breaking 50%. The words ‘mechanical harvesting’ don’t enter the vocabulary around these parts, and the hand-picking means that the yields are managed at the level of individual vines, an approach that becomes cumulatively more crucial, the sweeter the style of the final wine. This is, though the point scarcely needs emphasising, a Riesling monoculture. Mülller told me that the estate had experimented with other varieties in the postwar period, but that nothing comes close to the diamond-bright majesty of Mosel Riesling. When the grape is as famously versatile as it is, why try to find an understudy for a class act? At Kabinett level, the wines are piercingly pure expressions of their variety, full of the slaty minerality of the region, thrown into parallax shift by that almost subliminal suggestion of underlying honey, and sprinkled with finely pared lime zest. These age quite as intriguingly as their much richer cousins, as was evidenced by a sample from the annus mirabilis, 1971, which retained a light, pineappley freshness, and still had enough intact acidity to tingle the edges of the tongue on a December morning. With Spätlese, the varietal character is more sharply etched still. There are splashes of the lime’s juice, as well as parings of its zest, and even a little festively musky tangerine, in the 2006. With bottle-age, weightier notes – honeycomb, beeswax – emerge, as do the wine’s intrinsically drier components, the 1990 showing barbed, defensive acids still. Lusher tropical fruits begin to join the textbook lime in the case of the Auslese wines. There’s a touch of mango in the 2006, gorgeous mushy-ripe peach-flesh in the 1999, but again, that more austere note, of varnished antique wood, mingling with thick honey in the legendary 1976. Best bottlings of any particular wine are given the entirely subjective, non-systematic category of Goldkapsel (Gold Capsule) by the estate, and a 1997 Auslese shows eloquently what’s meant by the concept. It has big, rich waves of apricotty rot, but remains fresh and pure in its beautiful intensity and, while the acidity is relatively low, the balance on the wine is unarguable. At the most luxurious end of the spectrum are the wines with full-blown botrytis. Half-bottles of the Beerenauslese 1994 exhibit a deep, lush gold sheen, that note of still-sticky varnish on the nose, and then a plunge into peachy-gingery heaven on the palate. These are wines that barely attain the potency of strong wheat beers (6.5% in this case), and yet possess the tastebuds imperiously with their graceful concentration. The 2005 Trockenbeerenauslese is going at auction now for a typical hammer price of around €4000 the bottle. What you get for your money is one of the greatest Rieslings made in a generally outstanding German vintage. Naturally, the wine is crammed in every nook and cranny with layers of peachy, apricotty botrytis, the fruit infused with vanilla as if in emphasis of its crème brûlée texture. A colossal, clinging, silky palate displays pure mineral intensity at the centre, and stunning balance. It literally lacks nothing. Yields of 15 hectolitres per hectare obviously help, and when a wine is this concentrated, its substance and extract more than compensate for its tiny alcohol – a mere 5.5%. As a coda to a scintillant tasting, it is heartening to discover that Scharzhof is still fully committed to Eiswein production. Mülller had temporised only the previous week as to whether to make some 2007 Eiswein during the pre-Christmas cold snap, and had thought better of it. We did get to taste the 1996, though. It had the deepest colour of all, virtually tawny, and a nervily intense bouquet of caramelised almonds. These are not rotted wines of course, and the relatively more austere style shows on a palate of stern concentration, where the citrically pointed acids are still quite obtrusive. And yet there is balance again, the wine filling out all corners of the mouth despite its scant 6% of alcohol. As Madrid geared up for its felix navidad, the Fundación was running the best wine show in town. This was truly a masterclass in the capabilities of both the Riesling grape and one of the world’s currently unfashionable but illustrious vineyard regions.